861 records – page 1 of 18. 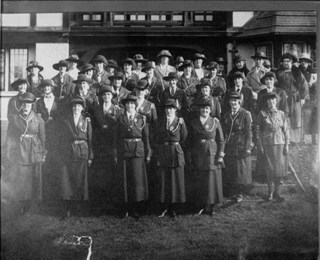 Photograph of a Ladies Organization that ran from 1914 to 1918. This is a Wurlitzer Military Band Organ, Style 146B. 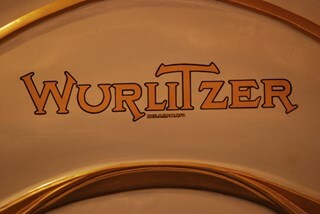 Built by the Rudolph Wurlitzer Company, ca 1925. The organ is supposed to recreate the sound of a 20-piece military band, with percussion instruments that include bass drum, snare drums, cymbals, and xylophones, as well as pipes to reproduce the sounds of trumpets, trombones, flutes, and violins. This band organ is operated by paper rolls based on Wurlitzer's unique, 46 note roll scale, "Style 150". Our Model 146B has duplex roll frames, allowing continuous playing, one roll rewinds as the other is playing. An electric motor mounted on the top uses a belt to drive a crankshaft that powers both the air bellows that feed the various music pipes as well as the roll mechanism. The band organ was originally intended to be used with a carousel out of doors. A perferated sheet of plexie glass has been placed over the front opening to reduce the volume of the instrument inside the carousel building. The band organ was purchased and restored by the Friends of the Carousel to replace the original organ that had been sold before the carousel was acquired for the Burnaby Village Museum. The Friends of the Carousel bought this machine from a collector in Spokane, Washington. He had obtained it from a closed down travelling carnival company in Reno, Nevada. They had used it with a carousel in the American mid-west. 270 p. : ill. l 22 cm. Photograph of the Edmonds Baptist Church senior boys club on a nature hike. Standing, left to right: Alex Bodley, Bill Astin, Bill Stickle, Arthur Thomson, Cecil Craig, and Joe Harris. Front, left to right: Norman Thomson and Walter Harris. Arthur Thomson was the group leader. Arthur Thomson and Norman Thomson were brothers. Photograph of the Windsor School Parent-Teacher Association. Identified: (front row, far left) Mrs. Violet Terry Rogers. Mrs. Rogers's husband, Frederick Rogers, an electrical contractor, did the electrical wiring for Windsor School when it was built. 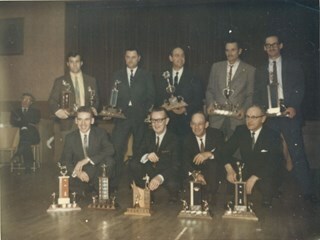 Photograph of men from the the North Burnaby Fish & Game Club with trophies in their hands. 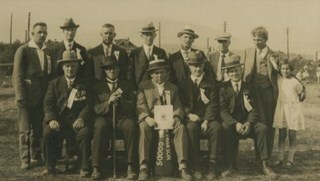 The men standing in the back row are; Pete Emmett, Bill Halliday, unidentified, Wes Menaar, and unidentified. The men kneeling in the front row are; Pat Dohrety, Jack Tattersall, Cliff Wells, and John Norman. The men are wearing suits and here is a stage behind them with a lowered curtain. Photograph of the Canada Confederation Celebration Committee sitting and standing in two rows on the Central Park Sports field. Photographer's stamp on verso of mat reads: "Lloyd's Studio/ 3966 Kingsway/ McKay BC Carl. 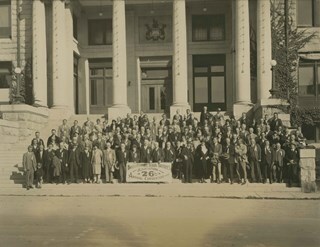 343R2"
Photograph of the members of the British Columbia School Trustees Association meeting for their 26th Annual Convention at a courthouse in Vernon. They are standing on the courthouse steps. The Dickson family is standing in the front row on the far left and Harper is standing beside them. The British Columbia School Trustees Association was founded in 1905 when 20 school trustees representing eight school boards met at the Vancouver School Board office to discuss common problems and ways to improve public education. Continuation of title: "26th Annual Convention"
Photographer's stamp on recto of mat reads: "Ribelin/ Vernon/ & Kelowna, B.C." Photograph of students in the Burnaby North High School Latin Club. Photograph of a Burnaby South High School cadet drill. 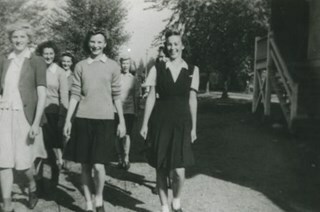 Front, left to right: Joan Goode, Leona Milne, and Vera Jackson Pel. Behind, left to right: Frances Spackman, Pat Whittle, and Helen Mitchell. Photograph of group of people at a provincial PTA (Parent Teacher Association) Convention. Identified: Mr. Fennell (back row, 3rd from left). Photograph of Rudy Spence presenting an Arts Council cheque to Burnaby Historical Society Treasurer Dennis Brown. 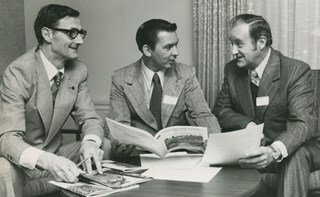 Photograph of Burnaby Lawyer Dudley Edwards, when he was a guest speaker at the Burnaby Community Council. He spoke to the Council about juvenile delinquency at a meeting that took place at the Astor Hotel. 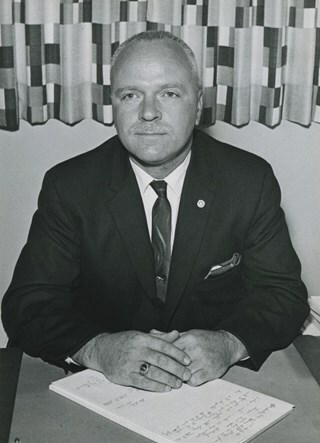 Photograph of George H. Leaf, New Westminster Optimist Club Man of the Year for 1956 for his many years of work with minor lacrosse and hockey clubs. 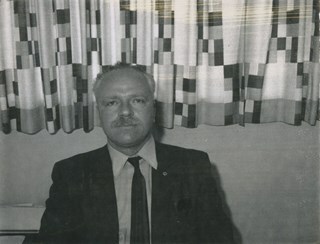 Photograph of then president of the Burnaby Tenants Association, Grant LaFaive. Photograph of Charles V. Oates president of Union Local 835 (Hotel, Motel, Restaurant and Culinary Employees and Bartenders International Union) sitting at a desk, with patterned curtains in the background. Photograph of Charles V. Oates president of Union Local 835 (Hotel, Motel, Restaurant and Culinary Employees and Bartenders International Union) sitting at a desk and writing on a pad of paper, with patterned curtains in the background. 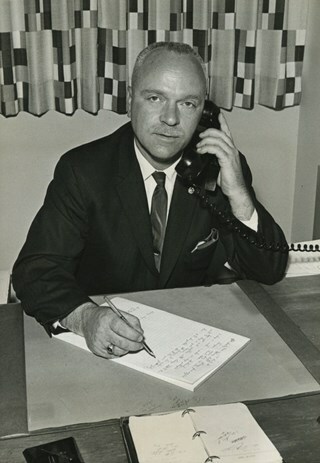 Photograph of Charles V. Oates, president of Union Local 835 (Hotel, Motel, Restaurant and Culinary Employees and Bartenders International Union) sitting at a desk, talking on the phone, and writing on a pad of paper. There are patterned curtains in the background. Women's Section ULFTA The Pas, Man. 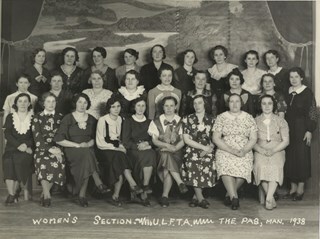 Photograph of the Women's Section of the Ukrainian Labour Farmer Temple Association (ULFTA) for The Pas, Manitoba. 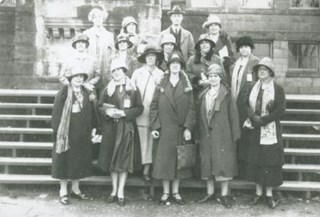 Eugenia “Jenny” (Haresomovych) (Carman) Nagy is standing at the centre of the second row. Note written on album page reads: "centre + centre row"
Photograph of Sally Gribble, founder of Mothers Against Drunk Drivers (MADD). Note in black and red ink on recto of photograph reads: "02/04 BNW p. 2 40% / 94 - 1639 B File Bby"
This portion of the interview pertains to W.H. "Harry" O'Brien's decision to join the Army of the Common Good and its Cooperative (CG Co-op) as well as the South Burnaby Union of the Unemployed. Harry discusses his father's work as caretaker at Central Park and helping to deal with wood cutting permits and land clearing by men who were on script. Recording is a taped interview with W.H. "Harry" O'Brien by SFU (Simon Fraser University) graduate student Bettina Bradbury. Major themes discussed are: the Army of the Common Good, the Union of the Unemployed and the Common Good Credit Union (now the South Burnaby Credit Union). To view "Narrow By" terms for each track expand this description and see "Notes". W.H. “Harry” O’Brien was born in the coal mining town of Nanaimo, British Columbia on October 20, 1914. He came to Burnaby with his parents and five siblings in 1927. 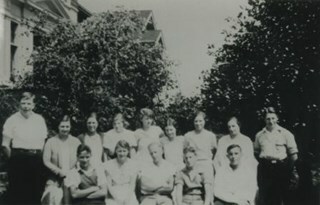 Harry’s mother, a school teacher, wanted her children to live closer to school in order to obtain a better education, so the O’Brien family settled at Inman Avenue, Burnaby. Harry left school in June of 1929. Harry’s father worked as the caretaker at Central Park around this time and Harry helped him to clear brush, plant trees and enforce the land clearing and wood cutting permit regulations held by men who were on script. Although too young to vote by just over a week, Harry O'Brien worked as a scrutineer for the Co-operative Commonwealth Federation (CCF) during the 1935 Federal Election. 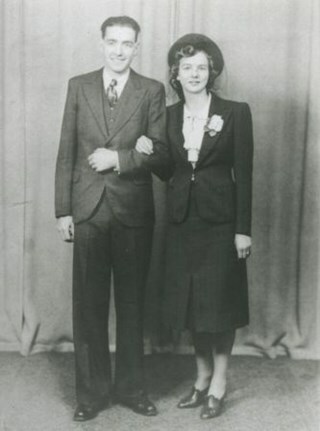 On October 12, 1940 Harry O'Brien married Gertrude Crossan at St. John the Divine in Burnaby. The Crossan family came to Burnaby from Winnipeg in 1933 and settled at Nelson Avenue. Gertrude's mother, Mary Anne Crossan, was Gilmore Avenue School's first teacher. Harry began his involvement with the Unemployment Organization in Burnaby by participating in an organised protest against the municipality for homeowner evictions brought on by unpaid taxes. The South Burnaby Union of the Unemployed organised in order to protest rules around receiving Relief. Harry became involved, eventually becoming one of the spearheads of the organization, taking over as secretary by 1936. Harry was an original member of the Army of the Common Good, helping to produce over one hundred and twenty-five tons of vegetables from its own gardens to feed Burnaby citizens suffering from the lack of resources during the Depression years. 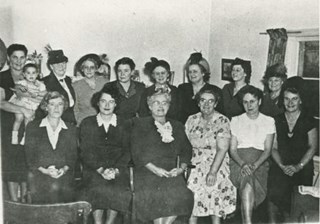 The members of the Army of the Common Good who cut wood for consumption or worked in the gardens were given credit for their work through LU (Labour Units) which they could then use to buy groceries and that at the Army's Cooperative stores, one of which was at McKay Avenue, where Harry began working as Manager of Groceries in 1937. The Credit Union movement of British Columbia was also organized by Harry O'Brien and his fellow Army of the Common Good members. W.H. "Harry" O'Brien died July 1, 1992. Track two of interview with W.H. This portion of the interview pertains to W.H. "Harry" O'Brien's memories on the reaction of the community to the Union of the Unemployed. Harry mentions other Unemployed organizations throughout Metro Vancouver as well as the Workers Unity League and the Vancouver Trades and Labour Council and their purpose. Track four of interview with W.H. This portion of the interview pertains to W.H. "Harry" O'Brien's involvement with the formation of the Army of the Common Good Credit Union (now the South Burnaby Credit Union). Track eight of interview with W.H. This portion of the interview pertains to John Aloysius "Jack" McGeachie's political views, giving voice to the widely held antagonism people held towards the R.B. Bennett government and its attitude toward the unemployed. Jack also discusses the great snow storm of 1933, brush fires in Burnaby and the Richmond Street Fire. Recording is a taped interview with John A. 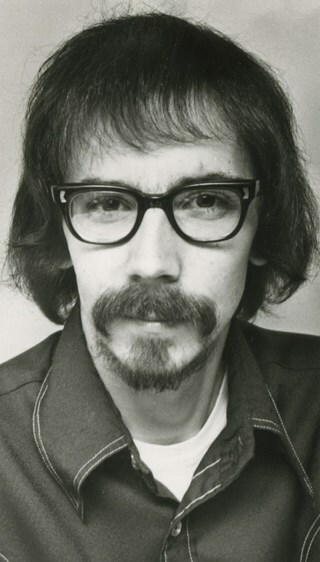 "Jack" McGeachie by SFU (Simon Fraser University) graduate student Bettina Bradbury June 18, 1975. Major themes discussed are: the Depression, the CCF (Co-operative Commonwealth Federation) and farming in Burnaby. To view "Narrow By" terms for each track expand this description and see "Notes". John Aloysius “Jack” McGeachie was born January 14, 1914 in Little Mountain, Vancouver to Helen and John McGeachie. 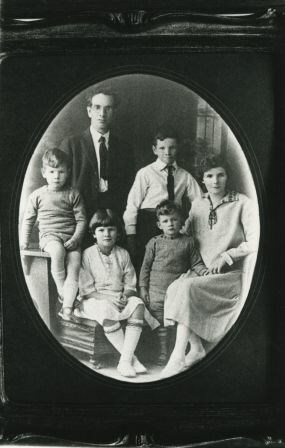 Helen and John had four children; John Aloysius “Jack”, Florence Mary, Thomas Joseph “Tom” and Roderick Noel “Rod.” In 1922 the McGeachie family moved from Vancouver to East Burnaby where the children attended Edmonds School. John Sr. became ill and died, leaving the eldest Jack as the main breadwinner of the family when he was still just a teenager. He began his working life at a chicken farm, later learning his trade while working for the Hudson Bay Company. Jack McGeachie married Burnaby Historian Doreen Pixie Johnson. He and Pixie raised their children Kathi (Dunlop) and David McGeachie in the house the couple built themselves in 1947. John Aloysius "Jack" McGeachie died October 12, 1981 at the age of sixty-seven. Doreen "Pixie" (Johnson) McGeachie died August 14, 2010 at the age of eighty-nine. This portion of the interview pertains to Alfred Bingham's memories of Unemployment organizations in Burnaby and his own participation in Relief work. Recording is a taped interview with Alfred Bingham by SFU graduate student Bettina Bradbury June 10, 1975. Major themes discussed are: the Depression, Pioneers, and the Co-operative Movement. To view "Narrow By" terms for each track expand this description and see "Notes". Alfred "Alf" Bingham was born in England in 1892 and moved to Canada in 1912. His first job in Canada was laying track for the Grand Trunk Pacific Railway (GTPR) from Edmonton to McBride in 1912. His second was in Vancouver at the Rat Portage Mill on False Creek, working on the Resaw machine. He quit after one week due to poor working conditions. After taking part in the 1919 Winnipeg General Strike as a delegate of the Retail and Mailorder Union (A.F.L.) on the Winnipeg Trades and Labour Council, Alfred moved to Burnaby where he and fellow Burnaby residents Angus McLean and Percy Little worked ten hour days to build a Shingle Mill on the edge of Burnaby Lake for Simpson & Giberson. George Green, carpenter and millwright (author of “The History of Burnaby”) also helped in the construction of the mill. Alfred built his own home from lumber cut from the mill in the Lochdale area on Sherlock Street between Curtis Street and Kitchener Street. On April 10, 1920 Alfred married Mary Jane “Ada” Reynolds. Alfred and Ada often took in foster children during their marriage. Due to her nursing experience, Ada was often called upon to deliver babies in the Burnaby area. Alfred and Ada Bingham were instrumental members of the Army of the Common Good, collecting vegetables and grains from growers in the area and even producing over 125 tons of vegetables from its own gardens to feed children and youth suffering from the lack of resources during the Depression years. The army was in operation for ten years and during that time the members organised the Credit Union movement of British Columbia and drew up the Credit Union act thorough the Vancouver Co-operative Council. They also started Co-Op stores and the Co-Op Wholesale Society. Alfred was also Secretary of the Burnaby Housing committee and in 1946 he became the Secretary of the North Burnaby Labour Progressive Party (LPP). Mary Jane “Ada” (Reynolds) Bingham died on August 9, 1969. Her husband Alfred died on April 29, 1979. This portion of the interview pertains to John Mallory's personal politics and his thoughts on the politics of the time, including the evolution of the Unemployed worker and working class philosophies. Recording is of an interview with John Mallory by Simon Fraser University (SFU) masters student Bettina Bradbury June 24, 1975. Major themes discussed are: the Depression and the Unemployment movement. To view "Narrow By" terms for each track expand this description and see "Notes". John Audrey Mallory was born in Carman, Manitoba on January 10, 1903 to John and Bertha Nina (Rodgers) Mallory. The Mallory family moved to Deep Creek, British Columbia for a time before arriving in New Westminster. John Audrey Mallory married Janet Ellis Morice on November 15, 1924. John Mallory helped to build a mill at Powell River where he played baseball before he moved to Burnaby in the late 1920s. He built a house at 11th Avenue and 13th Street. He later moved to 1851 4th Street, working a few months out of the year as a construction foreman. He also worked renovating various mills. Towards the end of the thirties, he had established his own heating and plumbing business. John Mallory was very active in the labour movement, beginning with the Independent Labour Party which was renamed the Independent Labour Party Socialists, then the Socialist Party of Canada. He joined the Workers' Unity League (WUL) and their affiliates the Unemployed Workers Association at this time as well. Together with fellow organizers, John fixed up the Edmonds Hall and held fundraising parties for the Unemployment movement. Seen by others as an agitator, John organized countless strike movements, protests and demonstrations in his capacity as an organizer for the Workers' Unity League. John left the Socialist Party of Canada due to what he saw as their intolerance with other parts of the working class movement to join the Communist Party of Canada. He was later expelled from the Communist Party for "Trotskist leanings." Bertha Nina (Rodgers) Mallory died May 20, 1964 at the age of eighty-two. Her husband John Mallory died April 1, 1966 at the age of ninety-four. John Audrey Mallory died July 7, 1981 at the age of seventy-eight. This portion of the interview pertains to John Mallory's involvement in the publishing of the paper entitled "the Unemployed Worker" and his thoughts on leadership. This portion of the interview pertains to John Mallory's memories of the municipality's job offer to organize the Lougheed Highway. John explains his dissatisfaction with the capitalist system. This portion of the interview pertains to John Mallory's expulsion from the Communist Party. He discusses his feelings towards the established system as well as Harold Winch's turn towards socialism. This portion of the interview pertains to John Mallory's resignation from the Socialist Party and his entry into the Communist Party, including comments on his friendship with Ernie Winch. He also discusses what he sees as the biggest problem in society today. This portion of the interview pertains to John Mallory's memories of the Depression years along with stories of how the Unemployment Organization overcame various challenges. This portion of the interview pertains to Florence Strachan's involvement with the Unemployed Organization in North Burnaby. She mentions Reeve William A. Pritchard. She also discusses how her family managed through the Depression. Recording is of an interview with Florence Strachan by Ross S. McLeod and Bettina Bradbury, June 20, 1975. Major theme discussed is: The Depression. To view "Narrow By" terms for each track expand this description and see "Notes". Florence Strachan was born in Aberdeen, Scotland in 1899. She met and married her husband in Scotland before coming to Atlantic Canada by ship in 1922, then from Quebec to Vancouver by train. When Florence’s husband got a job at Barnet Mills in 1924, the couple moved to Burnaby and rented a house at 2551 East Hastings Street. In 1926, the Strachans bought a house at 290 Ellesmere Avenue and concentrated on paying it off as quickly as possible. By 1931 the Mill had shut down, leaving Florence’s husband out of work, and forced to go on Relief. By this time the couple had two children, one born in 1928, and the other in 1930. Florence and her husband marched and picketed with the unemployed throughout the Depression. This portion of the interview pertains to Florence Strachan's involvement with the Unemployed Organization in North Burnaby as well as her personal life during the Depression. This portion of the interview pertains to John Ferguson's opinion of Reeve William A. Pritchard and the municipal politics of the time. He also discusses the sentiment he felt among the Unemployed. Recording is of an interview with John Ferguson by history student Ross S. McLeod, July 3, 1975. Major themes discussed are: the Depression. John Ferguson was born in Glasgow in 1900. He came to Canada with his family in 1910, and settled on Vancouver Island. In 1931 John Ferguson purchased the hardware store on the 3900 block of Hastings Street. This portion of the recording includes Alfred Bingham's reading of the letter he wrote to the secretary of The Royal Arsenal Co-Operative Society in London England, November 1937, describing the Co-operative Movement in Vancouver. Recording is of Alfred Bingham's writings, as read by Alfred Bingham. Major themes discussed are: Pioneers, early days in Burnaby and the Co-op Movement. To view "Narrow By" terms for each track expand this description and see "Notes". Alfred "Alf" Bingham was born in England in 1892 and moved to Canada in 1912. His first job in Canada was laying track for the Grand Trunk Pacific Railway (GTPR) from Edmonton to McBride in 1912. His second was in Vancouver at the Rat Portage Mill on False Creek, working on the Resaw machine. He quit after one week due to poor working conditions. After taking part in the 1919 Winnipeg General Strike as a delegate of the Retail and Mailorder Union (A.F.L.) on the Winnipeg Trades and Labour Council, Alfred moved to Burnaby where he and fellow Burnaby residents Aungus McLean and Percy Little worked ten hour days to build a Shingle Mill on the edge of Burnaby Lake for Simpson & Giberson. George Green, carpenter and millwright (author of “The History of Burnaby”) also helped in the construction of the mill. Alfred built his own home from lumber cut from the mill in the Lochdale area on Sherlock Street between Curtis Street and Kitchener Street On April 10, 1920 Alfred married Mary Jane “Ada” Reynolds. Alfred and Ada often took in foster children during their marriage. Due to her nursing experience, Ada was often called upon to deliver babies in the Burnaby area. Alfred and Ada Bingham were instrumental members of the Army of the Common Good, collecting vegetables and grains from growers in the area and even producing over 125 tons of vegetables from its own gardens to feed children and youth suffering from the lack of resources during the Depression years. The army was in operation for ten years and during that time the members organised the Credit Union movement of British Columbia and drew up the Credit Union act thorough the Vancouver Co-operative Council. They also started Co-Op stores and the Co-Op Wholesale Society. Alfred was also Secretary of the Burnaby Housing committee and in 1946 he became the Secretary of the North Burnaby Labour Progressive Party (LPP). Mary Jane “Ada” (Reynolds) Bingham died on August 9, 1969. Her husband Alfred died on April 29, 1979. Recording is of an interview with Edward Apps, conducted by Rod Fowler. Ed Apps was one of eleven participants interviewed as part of the SFU/Burnaby Centennial Committee's oral history series titled, "Voices of Burnaby". The interview is mainly about Ed Apps involvement in community groups, particularly his work in seniors organizations lobbying for seniors’ housing since his retirement, and views about the role of Rate Payer groups, unions and politics in the development of North and South Burnaby. He also talks about his origin in England, his war service, arrival with his wife Margaret in Burnaby in 1946, his work with the Burnaby School Board and for the local union, the location of some of the older schools, the history of his house, and briefly about his wife and children. To view “Narrow By” terms for each track expand this description and see “Notes”. Edward Apps was born in 1918 in London, England, and grew up in Kent and Essex. In WWII he flew the third glider to land in Normandy on June 6th, 1944. He and his wife Margaret Hope (1915-1985) immigrated to British Columbia in 1946, joining his wife’s parents, who had immigrated earlier in 1939, in Burnaby Heights in North Burnaby. He worked for the Burnaby School Board as Foreman Painter, and served on CUPE Local 379 Executive, until his retirement in 1982. In 1948 Ed Apps bought his first lot, for $150.00, in the 4700 block on Georgia Street, building houses there and in the 4100 block before buying his present home, a ca.1900 farm building, in the same area in 1954. North Burnaby was “bush country and orchards” in the 1950s; his two sons played in the ravines; and the family used the tram system on Hastings and Boundary Road for transportation. Development of municipal services seemed slower in North than South Burnaby, and Ed Apps remembers the strong role Rate Payers groups had in creating local services and lobbying Municipal Council for provide services. After retirement Ed Apps became involved in several local and provincial seniors organizations, advocating for better housing, including serving on the Executives of the Network of Burnaby Seniors and the Council of Senior Citizens Organization, and was active in the provincial Seniors Research and Resource and CMHC Housing Committee. He also served on the Centennial Committee of Burnaby. 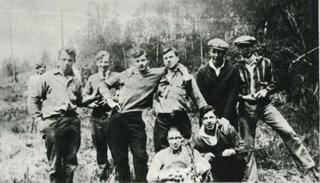 Photograph of seventeen unidentified young men seated and standing in three rows outside at an unidentified location. These men are believed to be Chinese Freemasons of British Columbia (previously named the Chee Kung Tong). Notes on verso of photograph read: "[illegible] Chinese Freemason" and "Dr. Lam / [illegible] in San Diego" and "[not equal to] 1914"
Photograph of members of a club in China seated and standing together in two rows. Lin Chuck Lee is standing in the second row, second from the left. No other individuals have been identified. Note written in inside cover of folder reads: "2nd fr left 2nd Row Lin Chuck Yee - 1938"
Photograph of members of the Canada Victory Bonds organization Chinese branch in Victoria, B.C., seated and standing together in two rows. The photograph was taken on June 1, 1941 in the hall of the Chee Kung Tong Chinese Freemasons building. Lam Chuek Yue/ Lum Chuck Yu, the last owner of the Way Sang Yuen Wat Kee & Co. Chinese herbalist shop, served as the committee secretary (front row right-1). 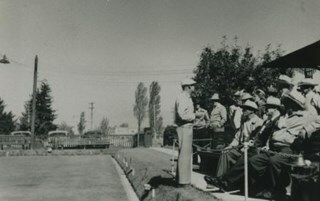 Photograph of members of the Central Park Lawn Bowling Club seated on benches beside a bowling green. Identified: Mr. Davies (standing 3rd from left wearing dark pants and a light-coloured shirt and hat). File consists of papers pertaining to the organization of block parties for Burnaby's Centennial Celebrations. v-xi; 215 p. : ill. ; 18 cm. inside, "G. Paterson '23" "McAinsh & Co. Limited College St. Toronto" "VBA 165" crossed out "S 107"
Author's given name and dates: Norris, James F. (James Flack), 1871-1940.